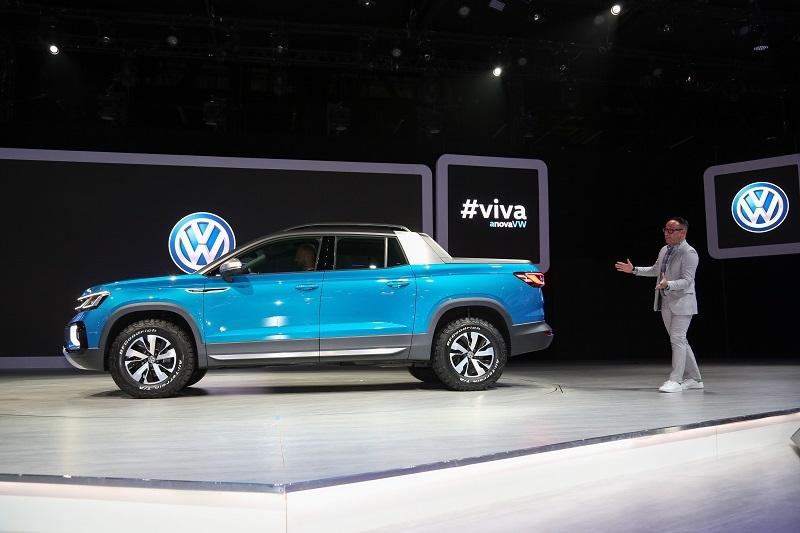 Dateline Sao Paulo International Auto Show in Brazil – Volkswagen revealed an interesting Tarok Concept all-wheel drive pickup truck sized below a mid-size reminding us of compact or sport trucks from the past. 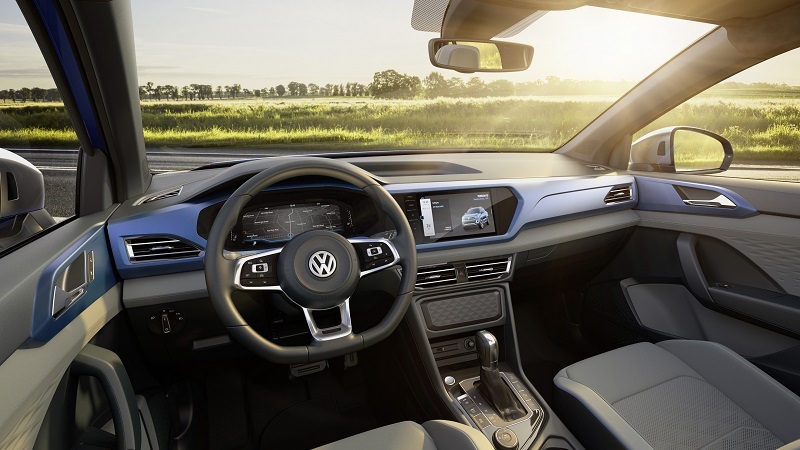 In revealing the Tarok – calling it a ‘concept’ – VW officials said it was slated, with few modifications, to go into production for Brazil in 2020. Further, they indicated that ‘future’ versions were likely to be developed for other markets. Details are a bit scant, but here is what we have gleaned from reports out of the Sao Paolo show. The Tarok Concept four-door five passenger AWD vehicle features a design that appears urban SUV-like from the front and side, while presenting a utility-like look from the rear. 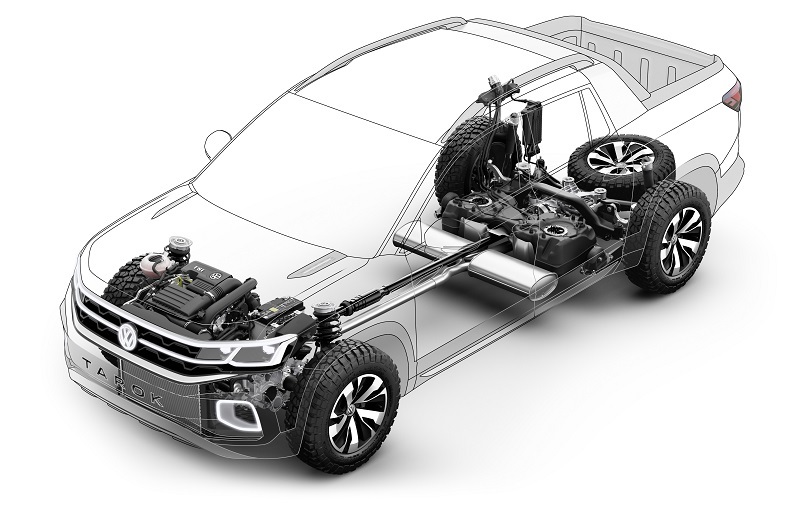 We noted that is built on their flexible MQB platform also used for the Atlas SUV and Tanoak Concept pickup. 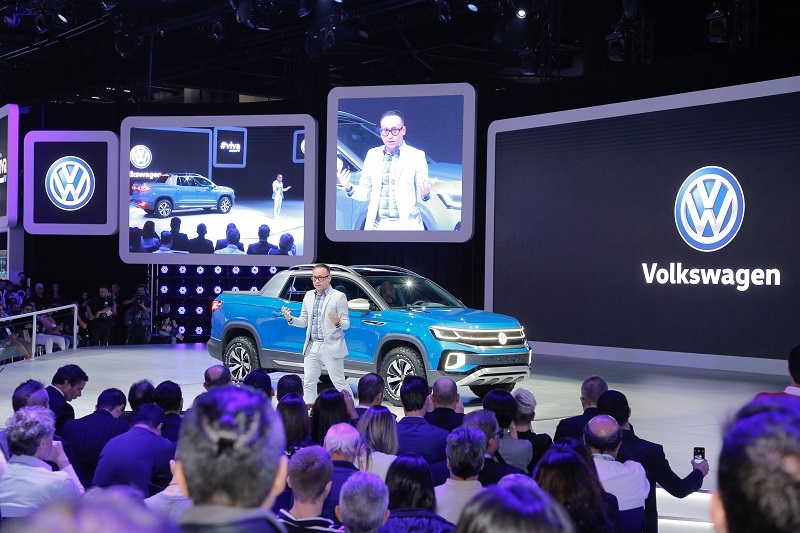 Volkswagen officials present said that using this platform enabled them to meet their design objective to merge the advantages of a small urban SUV with the practicality of a flexible pickup truck to satisfy multiple lifestyles. From our perspective, Tarok appears to have taken cues from the recently shown slightly larger Tanoak mid-size pickup concept likely to be produced for the US market. (see link at end of article). Some of those elements include the distinctive front end, Targa-inspired roof bar and three-dimensional LED lighting strip in the rear. The flexible load deck of the Tarok particularly interesting. 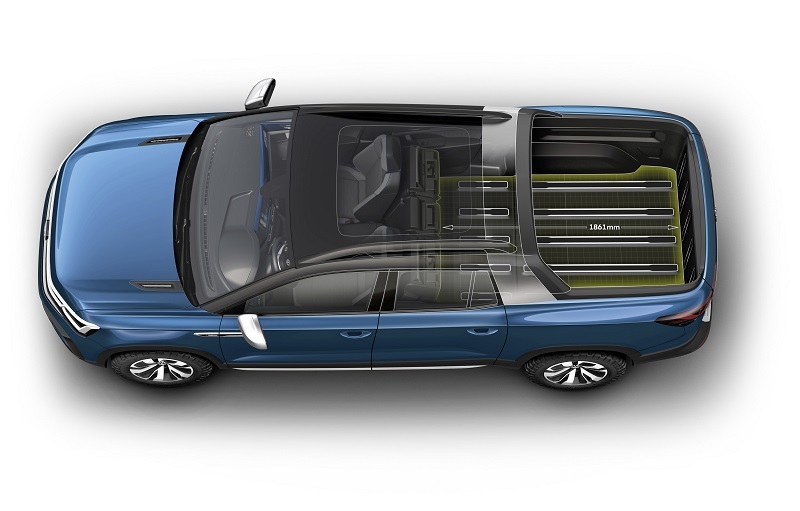 It can be extended by lowering the tailgate of the bed and/or lowering the panel just behind the second-row seating into the cabin (see photos). With the second-row seats folded down and using either or both methods – the Tarok can haul longer items in its bed. With a rated load capacity of about 2,000 pounds, it can handle heavier cargo as well. The interior of the Tarok says ‘digital’ in both style and function. A Cypress Metallic color-keyed panel, crossing the entire dash, is the operational and visual focal point. It surrounds the key cockpit elements including a glass-covered infotainment system, digital climate controls, the VW Digital Cockpit plus all of the relevant displays and controls. The power plant in the Tarok shown is a 1.4L TSI four-cylinder 150 horsepower gasoline engine combined with a 6-speed automatic transmission and the VW 4-MOTION all-wheel drive. After introduction, a future available version was said to likely be powered by a 2.0L (150 horsepower) turbo diesel direct injection (TDI) TSI in addition to the gasoline engine. Looking at the pictures and available materials, the Tarok reminds me of a couple of ‘compact’ utility vehicles (we called them ‘sport trucks’) from the past. In particular the Subaru Baja that was sold in the US from 2003 to 2006 comes to mind. 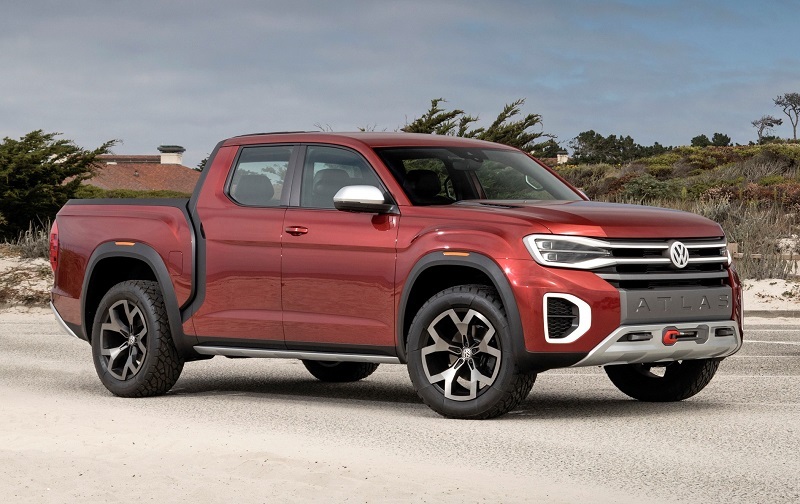 Given the US market focus on full-size and mid-size pickups currently coupled with a likely VW introduction of the Tanoak by 2020, it looks like VW will be in the mid-size truck game with the Tanoak. However, I am not sure that the US market is ready (yet) for a compact ‘sport truck’. But if the market evolves, VW just might be there with the Tarok ready to go. 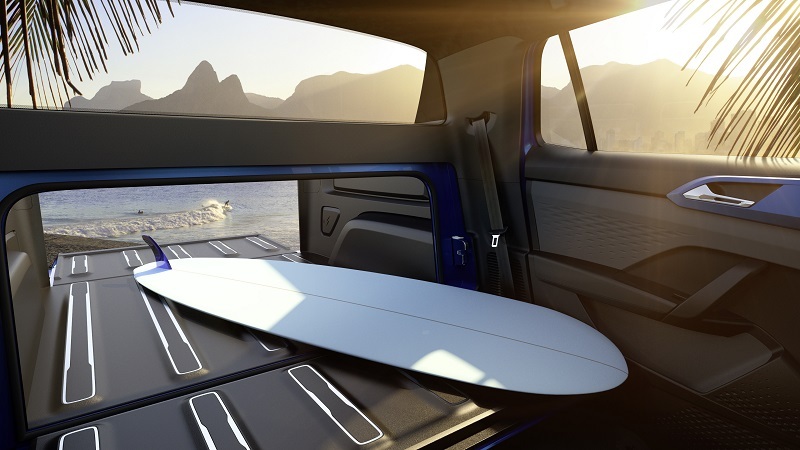 Here is the link to our story in August about the Tanoak mid-size pickup concept that ‘appears’ to be moving to production for the US market in late 2019 as a 2020 model.